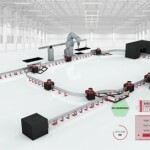 ABB has expanded its collaborative automation offering with the launch of a new single-arm YuMi robot. 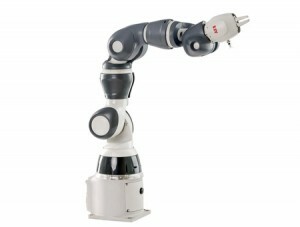 The IRB 14050 single-arm YuMi is ABB’s most agile and compact robot and is designed to easily fit into existing production lines to increase flexibility while working safely alongside people. The new collaborative robot is one of the first of a new generation of robots from ABB to be built on a flexible new modular design platform that will allow a greater variety of robots and sizes, and more tailored solutions. Weighing less than 10kg, and capable of being mounted from a ceiling, table and wall, this new addition to the YuMi family offers increased flexibility to help meet high-mix, low volume production in short cycles. 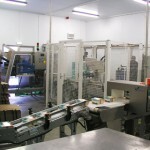 Easy to install, the single-arm YuMi allows manufacturers to quickly and easily add collaborative applications to their production lines with minimal interruption to existing operations. 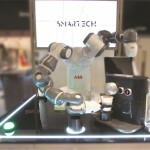 The launch of the single-arm YuMi expands ABB’s collaborative robot offering started in 2015 with the dual-arm YuMi, the world’s first truly collaborative robot. As part of the connected “Factory of the Future”, the YuMi family heralds a new era of robotic co-workers which can work side-by-side on the same tasks as humans while still ensuring the safety of those around them. 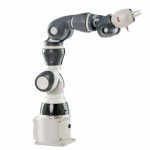 The single-arm YuMi also features the same intuitive, easy-to-use lead through programming as the dual-arm YuMi, meaning that workers without specialized training can setup and operate the robot. 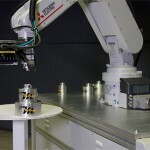 Combining this simplicity with the robot’s deployment flexibility can help manufacturers in many industries offset shortages of skilled workers.